During today's dive I was hoping to come across pot-bellied seahorses, but unfortunately I wasn't able to find any. However, while looking hard I did come across some other interesting cryptic species like flounder and gobies. I also spent quite a deal of time chasing this blue-lined leather jacket around a pillar in an attempt to get a full body photo, however, I had to settle with a "hide and seek" photo. In addition to all the great fish there are lots of very beautiful and colorful invertebrates. These Australian biscuit stars are my absolute favorite. They come in a variety of different colors. In fact, it seems everyone that you come across is unique. 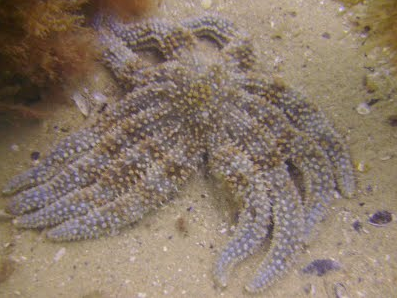 There are also many large eleven-armed sea stars that are often 12-15" in diameter. Tomorrow I head out for another good seadragon site. Great shots Jeremy! Any urchins?